Staff transitioned from the School of Social Welfare to the Education, Social & Biobehavioral SSC. The ESB-SSC began supporting the school on July 5th. Staff transitioned from the Biodiversity Institute, Kansas Biological Survey, and Kansas Geological Survey to the Engineering, Technology, & Environment SSC. The ETE-SSC began supporting these Designated Research Centers on July 5th. With the transition of these final areas into Shared Services, this project is now complete. Implementation planning continued with the units transitioning into the ESB and ETE SSCs on July 5th. Summer Pay Confirmation Reports were generated and distributed to faculty. Implementation planning continued for the Biodiversity Institute, Kansas Biological Survey, Kansas Geological Survey, and the School of Social Welfare. These units will transition to shared services on July 5th. Staff continued to enter data in the Summer Pay Collection (SPC) system. Confirmation Reports will be sent out on May 18th. The first wave of the Engineering, Technology, & Environment (ETE) SSC went live on March 14th. Staff transitioned from the School of Engineering, Center for Environmentally Beneficial Catalysis, Center for Remote Sensing of Ice Sheets, Information & Telecommunication Technology Center, and Tertiary Oil Recovery Program. The SSC implementation team held an additional planning meeting with leadership from the School of Social Welfare, which will transition to the Education, Social, & Biobehavioral SSC on July 5th. The process review was completed for this area as well. The SSC implementation team held additional planning meetings with leadership from the Biodiversity Institute, Kansas Biological Survey, and the Kansas Geological Survey, which will transition to the ETE-SSC on July 5th. The process review was completed for these areas as well. Version 2 of the Summer Pay Collection (SPC) system went live. Staff across campus were trained in how to use the system. Held the initial leadership team meeting with the School of Social Welfare, which will transition into the Education, Social, & Biobehavioral SSC on July 5th. Held the initial leadership team meeting with the Biodiversity Institute, Kansas Biological Survey, and the Kansas Geological Survey, which will all transition into the Engineering, Technology, & Environment SSC on July 5th. Preparation for the March 14th go-live of the first wave in the ETE-SSC continued. Version 2 of the Summer Pay Collection (SPC) system was tested and moved to production. Training was scheduled for mid-March. July 5th was finalized as the date support for the Biodiversity Institute, Kansas Biological Survey, and the Kansas Geological Survey will transition to the ETE-SSC (wave 2). This is also the date support for the School of Social Welfare will transition to the Education, Social, & Biobehavioral SSC (ESB-SSC). Jim Hammen, an Accounting Specialist in the Mechanical Engineering department, was hired as the Finance Manager for the ETE-SSC. Elenor Buffington, Business Manager for the School of Law, was hired as the Research Manager for the ETE-SSC. Completed the process review for the first wave of the Engineering, Technology, & Environment (ETE) SSC. Held the second ETE-SSC leadership team meeting with Engineering and separately Research. Finalized the SSC staffing levels for wave 1. Had an initial meeting with a furniture vendor and DCM to outfit the space in Eaton Hall for the ETE-SSC. The first wave of staff will transition on March 14th and the space should be ready. Met with HR and Research to begin planning for the second round of the Summer Pay Collection system and process. The goal is to have the system available for data entry the first week of March with a number of enhancements. The Pharmacy & Biomedical Research SSC (PBR-SSC) started supporting the School of Pharmacy and the Core Service Laboratories on November 9th. Training began for the PBR-SSC and also for other staff that were recently hired in other SSCs. The initial leadership team meetings were held with the School of Engineering and the research centers that are part of the first wave of the Engineering, Technology, & Environment SSC (ETE-SSC). This wave will transition on March 14th. Implementation planning continued in preparation for the School of Pharmacy and the Core Service Laboratories transition into the Pharmacy & Biomedical Research (PBR) SSC on November 9th. Vacant positions were posted and are in the process of being filled. Caitlin Day Wedel, currently an accounting specialist in the College & Professional Schools (CPS) SSC, was hired as the PBR-SSC finance manager. Michelle Ginavan Hayes, currently the research manager in the CPS-SSC, was hired as the Engineering, Technology, & Environment (ETE) SSC director. A search for her replacement will begin immediately. The activity assessment was administered to the staff in units that will be supported by the ETE-SSC. Implementation planning continued in preparation for the School of Pharmacy and the Core Service Labs transition to the Pharmacy & Biomedical Research SSC (PBR-SSC). An initial planning meeting was held with leadership from the School of Engineering and the Office of Research to plan out the implementation of the Engineering, Technology, & Environment SSC (ETE-SSC). Meetings to develop requirements for the new ePAF forms and process continued. The School of Education and the Achievement & Assessment Institute transitioned to the Education, Social, & Biobehavioral SSC on August 3rd. A kick-off meeting was held with the School of Pharmacy leadership to begin planning the transition to the SSCs. Pharmacy and the Core Service Laboratories will transition to the Pharmacy & Biomedical Research SSC on November 9th. The process review was conducted with the School of Pharmacy. The final SSC was named the Engineering, Technology, & Environment SSC (ETE-SSC). Initial planning for that SSC will begin in October. Completed final preparation for the August 3rd transition of the School of Education and the Achievement & Assessment Institute (AAI) into the Education, Social, & Biobehavioral SSC (ESB-SSC). Roles and Responsibilities meetings were held with the staff and leadership of the School of Education and AAI in preparation for go-live. The SSC Social Committee hosted an all-SSC Picnic at the Douglas County 4H Fairgrounds. The SSC initiative provided $480,000 in permanent base savings for FY16 to the Provost Office for strategic investment in Bold Aspirations. Preparation continued for the August 3rd support transition of the School of Education and the Achievement and Assessment Institute into the Education, Social, & Biobehavioral SSC. Support for the Animal Care Unit transitioned to the Pharmacy & Biomedical Research SSC (PBR-SSC). Completed the process review for the Core Service Laboratories, which will transition to the PBR-SSC in October. A kickoff meeting with the leadership from the School of Pharmacy was scheduled for August. Additional training videos were outlined to expand the SSC training program. The process review was completed with AAI and the School of Education. Sara Crangle, Compliance Coordinator within the Office of Research, was hired as the Research Manager for the Pharmacy & Biomedical Research SSC (PBR-SSC). Kelly Blackburn, Senior Grants and Contracts Administrator within the Office of Research and Technology Transfer at Wichita State, was hired as the Research Manager for the Education, Social, & Biobehavioral SSC (ESB-SSC). Summer Pay Confirmation Reports were sent to faculty that have pay in the summer. Feedback was mostly positive. A group of stakeholders met to discuss ways in which the process could be improved next year. Roles and Responsibilities meetings were held with several of the professional schools moving in the College & Professional Schools SSC (CPS-SSC). Support for the Schools of Architecture, Design, and Urban Planning; Business; Journalism and Mass Communications; Law; and Music transitioned to the CPS-SSC on April 13th. The Process Review was held with staff from the School of Education and an additional leadership meeting was conducted. The Summer Pay Collection (SPC) System went live and several hundred rows of summer related funding were keyed into the system. The quarterly coordination meeting was held with Procurement Services and the Comptroller’s Office. Several working groups were created to improve communication, university contracts, and overall procurement processes. Jessica Johnson, formerly an HR Coordinator in the CPS-SSC, was hired as an HR Manager in the CPS-SSC. Lori Gutsch, formerly an Accountant in the CPS-SSC, was hired as a Finance Manager in the Campus Administration & Operations SSC (CAO-SSC). Over 100 individuals were trained on the new Summer Pay Collection (SPC) System. Renovation of the 3rd floor of Carruth-O’Leary was completed. Staff were selected from the 5 professional schools that will be supported by the College & Professional Schools SSC (CPS-SSC) starting April 13th. A kick-off meeting was held with leadership from the School of Education to begin preparing for their implementation this summer. Support for the Libraries transitioned to the Campus Administration & Operations SSC on February 16th. Initial leadership team meetings were held with the five professional schools that will be supported by the College & Professional Schools SSC (CPS-SSC). Process reviews were also completed. The renovation of Strong 342 was completed to make room for the additional staff joining the CPS-SSC on April 13th. Renovation of the south 3rd floor of Carruth-O’Leary started. This space will house the Education, Social, & Biobehavioral SSC. myCommunity was selected as the platform for the Summer Pay Collection (SPC) System. A development site/proof-of-concept was configured and several presentations were made to the Campus Financial Officers and Budgeteers. SSC and Library leadership finalized the transition plan for staff moving into the CAO-SSC. The staff selected from the Libraries are Kristin Vickers and Jo Nell Proctor. Planning began for the five professional schools that will be supported by the College & Professional Schools SSC. Leadership teams were formed and the initial meetings were scheduled. Requirements for the summer pay collection system were collected and a formal project was opened with Information Technology. Renovations started in Carruth O’Leary to make room for the Education, Social, and Biobehavioral SSC. Renovations also started in Strong to make room for the five professional schools joining the College & Professional Schools SSC. Activity Assessments were administered for the schools of Business, Journalism, Social Welfare, and Pharmacy, as well as the Achievement & Assessment Institute. The Summer Salary Working Group met to finalize requirements for the summer pay collection process. The Campus Administration & Operations SSC (CAO-SSC) implementation team met with the Libraries to conduct a process review. Support for the Libraries will be provided by the CAO-SSC starting 2/16/15. Campus Administration & Operations SSC (CAO-SSC) will retain its name. The SSC that will support the School of Engineering, the engineering related research centers, the Biodiversity Institute, and the two surveys has not yet been named. Activity Assessments were administered for the schools of Architecture, Education, Law, and Music, as well as the Libraries. The Biomedical Research SSC continued training on creating reports for their PIs in BudCast. The Communication Ambassadors met to discuss the new campus model. View the presentations. The Biomedical Research SSC continued working on BudCast grant reports for the PIs they serve. SSC leadership met with leadership from the Office of Research to discuss process improvement opportunities. The SSC implementation team began preparing for the activity assessment for the rest of campus (less the School of Engineering and its affiliated research centers). The Liberal Arts & Sciences SSC completed a satisfaction survey for the principle investigators it supports. The third wave of the Campus Administration & Operations SSC (CAO-SSC) transitioned on October 13th. The Biomedical Research SSC started supporting the Bioengineering Research Center on October 13th. The staff that transitioned on October 13th began the SSC training program. The CAO-SSC Advisory Committee met and received an update on the project. SSC Leadership finished meeting with the Deans to communicate the new campus SSC model. SSC Leadership met with Leadership from Human Resources Management to discuss opportunities to improve communication and processes. The SSC implementation team continued preparing for the transition of staff into the Campus Administration & Operations SSC on October 13th. Pat Kuester, Director the CAO-SSC, held Roles & Responsibilities meetings with the leaders and staff that are part of wave 3. SSC Leadership met with several of the Deans to communicate the new campus SSC model. SSC Leadership met with the Office of Research to discuss opportunities for further collaboration. Staff from the 3rd wave of the Campus Administration & Operations SSC assembled for their first staff meeting and to plan for the transition to the SSC on October 13th. The processes that define how the Bioengineering Research Center will interact with the Biomedical Research SSC were finalized during this period. The BR-SSC will begin providing support to BERC on October 13th. SSC Leadership met with HR Leadership to discuss the role of the SSC in supporting the new requirements for the Affordable Care Act. The Design Review Committee met and approved changes to the campus model. These changes are being communicated to Deans and Vice Provosts over the next three weeks and will be shared with the broader campus at the Communication Ambassador's Meeting on November 13th. SSC Leadership met with BERC Leadership to discuss their transition to the Biomedical Research SSC. The go-live date for BERC has been changed to October 13, 2014. Process reviews for the third wave of the Campus Administration & Operations SSC were completed. The CAO-SSC leadership team made staffing decisions for the third wave. SSC leadership met with the Office of Research to discuss delegation of approval authority within the SSCs on sponsored projects and a variety of other topics related to research in the SSCs. SSC leadership met with Dean Anderson to discuss challenges and things that are going well within the Liberal Arts & Sciences SSC. In addition, the chair and director survey used to measure the perceived effectiveness of SSC services was revised. SSC leadership launched a project to revise the go-live training program as well as develop a platform to deliver continuous training. Activity Assessments for the third wave of the Campus Administration & Operations SSC were completed. The implementation team started process reviews for the third wave of the CAO-SSC. The project team for the third wave of the CAO-SSC was created. SSC leadership met to develop a survey instrument to measure principle investigator satisfaction with SSC services. Training for the second wave of CAO and the Biomedical Research SSC continued. The SSC is working on a process to implement the new Travel Authorization requirements mandated by the Kansas Department of Administration. The second wave of the Campus Administration & Operations SSC went live on July 7th. Eleven staff transferred to the SSC and they will support 21 departments. The Biomedical Research SSC went live on July 7th and it currently supports the Higuchi Biosciences Center. This SSC will also support the Bioengineering Research Center at a later date. The Center for Research on Learning is now supported by Biobehavioral & Social Research SSC as of July 7th. Two new staff members were hired to support this area: Tanya Ketchum, HR, and Tobin Jennings, Research. The SSC implementation team began initial planning for the third wave of the CAO-SSC. The SSC implementation team continued to prepare for the July 7th go-live of the second wave of the Campus Administration & Operations SSC, transition of the Center for Research on Learning into the Biobehavioral & Social Research SSC, and the opening of the Biomedical Research SSC. The SSC implementation team finalized the approvers and workflow changes necessary in the Financial and HR systems to prepare for the July 7th go-lives. Pat Kuester, director of the Campus Administration & Operations SSC, hosted meetings to discuss SSC roles and responsibilities with the VPs, Directors, future SSC staff, and the staff remaining in departments. The SSCs met with representatives from the Office of Research and Financial Management Systems to brainstorm strategies for reimagining the delegation of PI approval in KUPPS for purchases on sponsored projects. The SSCs met with HR and IT to discuss requirements for the 3G process once onboarding is implemented in BrassRing. Go-Live preparation continued for the second wave of the Campus Administration & Operations SSC (CAO-SSC), the Biomedical Research SSC (BR-SSC), and the support of the Center for Research on Learning by the Biobehavioral & Social Research SSC (BSR-SSC). Each of these transitions will occur on July 7th. Met with staff in the Bioengineering Research Center to conduct a process review. Met with the PIs in the Higuchi Biosciences Center to discuss the BR-SSC implementation. SSC Leadership met with the Comptroller and Purchasing Offices to discuss transaction processing issues and brainstorm potential solutions. The SSC implementation team has been focusing on the three SSC go-lives described below. The Center for Research on Learning has become a center within the Life Span Institute. The Biobehavioral & Social Research SSC will provide support to CRL and Barbara Babcock has transitioned to this SSC as an HR Coordinator. The staff that will transition to the Biomedical Research SSC from the Higuchi Biosciences Center were selected: Kathy Kiefer, Faith Gorden, Sandra Holland, Penny Anderson, Aimee Bergmann, Emily Ramsey, Diane Bracciano, and Peggy Huey. Peggy Williams, currently at the Recruitment and Onboarding Center, will transition to the BR-SSC in time for go-live. The Campus Administration & Operations SSC (CAO-SSC) implementation team finished reviewing processes for the departments in wave 2. The CAO-SSC Leadership Team met and made staffing decisions for wave 2. Notifications are currently being sent to the impacted staff and directors. The Biomedical Research SSC (BR-SSC) implementation team met with HBC PIs of major program projects to discuss the SSC initiative. The SSC Directors met with leadership from the Office of Research to discuss opportunities for further collaboration. The Design Review Committee met and received project updates. Additionally, they reviewed the SSC departmental groupings to ensure they are organized as effectively as possible. The Campus Administration & Operations SSC (CAO-SSC) Advisory Committee met and received project updates on waves 1 & 2. A number of units from wave 2 of the CAO-SSC took the activity assessment. The CAO-SSC implementation team met with a number of units in wave 2 to review processes and discuss the transition to shared services. SSC Leadership continues to meet with leadership from the Higuchi Biosciences Center in order to plan the Biomedical Research SSC, which will go-live on July 7th. A number of vacant positions were filled in the Liberal Arts & Sciences SSC and the CAO-SSC. Greg Swart, from Procurement Services, was hired as the SSC Process Analyst. He will work with units and their respective SSC staff to continuously improve processes. A number of units that will be supported by the Campus Administration & Operations SSC completed the activity assessment. The Campus Administration Leadership Team met and received project updates on waves 1 and 2. The staff in the Higuchi Biosciences Center, which will be supported by the Biomedical Research SSC, completed the activity assessment. The Biomedical Research SSC implementation team met with leadership and PIs from the Bioengineering Research Center to discuss the SSC implementation. The SSC Leadership continues to partner with OIRP to develop tools for metric tracking. SSC leadership met with leadership from the Libraries and separately with Student Housing to discuss their respective SSC implementations. SSC leadership met with Human Resources leadership to discuss opportunities for further collaboration and streamlining of processes. Pat Kuester met with the directors and vice provosts impacted by the wave 1 transition of the Campus Administration & Operations SSC. The meetings focused on roles and responsibilities, workflow, and contacting the SSC. Wave 1 of the CAO-SSC went live on April 7. The staff attended a welcome breakfast. Staff from CAO started the standard SSC training program and began reaching out to directors to schedule their first introductory meetings. Initial planning for wave 2 of the CAO-SSC started. The SSCs met with OIRP and Procurement to discuss opportunities for collaboration on producing metrics. Leadership from the SSCs met with the Financial Accounting & Cash Control in the Comptroller's Office to discuss opportunities to streamline the revenue collection and deposit process. Pat Kuester, director of the Campus Administration & Operations SSC (CAO-SSC), hired all six of her finance and HR managers with staggered start dates. Pat Kuester and the CAO-SSC Managers met with the CAO-SSC staff in wave 1 to discuss the transition on April 7th. Staffing assignments were made for the CAO-SSC wave 1 staff and units. The CAO-SSC implementation team has been busy outfitting space, changing system access, and performing general preparation in anticipation of the wave 1 go-live on April 7th. The CAO Advisory Committee met and received updates on the status of wave 1 and plans for future waves. Amy Carlson was hired as the director of the Biomedical Research SSC (BR-SSC). Amy starts on April 7th and planning for the BR-SSC will begin right away. The BR-SSC implementation team met with Paulette Spencer and several PIs within BERC to discuss the SSC implementation. In addition, the team met with leadership from HBC to begin preliminary planning for the implementation. The target transition date for this SSC is July 7th, but the implementation date will be finalized during the planning process for each area. The SSC leadership met with leadership from Procurement and the Comptroller to brainstorm ways for further collaboration. Process improvement continues in the Liberal Arts & Sciences SSC as well as the Biobehavioral & Social Research SSC. Finalist interviews were held for the manager positions within the Campus Administration & Operations SSC (CAO-SSC). The staffing plan for wave 1 of the CAO-SSC was presented to leadership and approved. Activity assessments for CAO continued. Finalist interviews were conducted for the Biomedical Research SSC director. The Design Review Committee met and received status updates on the overall SSC project. The SSC leadership met with leadership from RGS to brainstorm ways for further collaboration. Karla Williams hosted a post go-live process improvement meeting for the 3G process (graduate student appointments and tuition sponsorships). Critical updates and improvements have been made to the electronic form and workflow. This process will be used in all of LAS and BSR for summer and fall tuition sponsorships. The Biobehavioral & Social Research (BSR) SSC went live on February 3rd and Cindy Nau hosted a welcome breakfast for BSR staff. The SSC implementation team hosted a training session for the Program Assistants in IPSR and LSI. Topics covered: how to contact the SSC, processes within the SSC, roles & responsibilities, etc. First round interviews for the Biomedical Research (BR) SSC were completed. Pat Kuester and her search committee completed first round interviews with candidates for the Campus Administration & Operations (CAO) SSC finance & HR managers. The SSC implementation team conducted several more activity assessments with groups that will be supported by the CAO-SSC. The staffing proposal for wave 1 is being prepared for the CAO Leadership Team. The target go-live date for wave 1 is April 7th. SSC leadership attended several process improvement and metric related meetings for AR/Billing, ImageNow, BudCast, and 3G (graduate student appointments and tuition sponsorships). Staff in the Liberal Arts and Sciences SSC that support the Natural Sciences & Mathematics are still going through training. The search committee scheduled interviews for the director of the Biomedical Research SSC. Pat Kuester, director of the Campus Administration & Operations SSC (CAO-SSC) continued to meet with VPs and directors that will receive services from this SSC. The implementation team for the Campus Administration & Operations SSC started the Activity Assessment with staff in the relevant departments. The Communication Ambassadors met on Thursday, January, 9. The slides are available here: http://cfe.ku.edu/ssc/documents.php. The SSC implementation team met with leadership from IPSR, LSI, and the staff from the Biobehavioral and Social Research SSC to review and confirm the processes that will be used starting on February 3. Pat Kuester’s first day as the director the Campus Administration & Operations SSC (CAO-SSC) was January 6. Pat Kuester and Jason Hornberger began meeting with the units that will be supported by the CAO-SSC to discuss implementation strategy and timeline. Leadership from the LAS-SSC met with staff from the Comptroller’s Office to discuss the pilot of the new AR/Billing module and its impact on the SSCs. The SSC started working with the Office of Institutional Research & Planning to build transactional and metric dashboards. The staff from Natural Sciences and Mathematics moved into the LAS-SSC on December 16th. Training started immediately and will continue through February. Meetings between SSC staff, department chairs, and department staff started. Several process meetings were held with staff in IPSR and LSI to prepare for the February 3rd transition date for the Biobehavioral and Social Research SSC (BSR-SSC). A draft communication plan was developed. The unit/center assignments for the BSR-SSC grant specialists were made. The director position for the Biomedical Research SSC was posted. The Design Review Committee met to review the implementation progress of the project. The SSC continues to utilize BudCast reports in their monthly meetings with chairs/directors. In addition, the SSC continues to work with the Budget Office to make improvements to the reports based on feedback from chairs/directors and PIs. The two research vacancies were filled in preparation for the transition of the Natural Sciences & Math staff to LAS-SSC: David Lytle from RGS and Leslie Hudson from HBC will transition to the LAS-SSC on December 16. Interviews were conducted for the Campus Administration & Operations SSC (CAO-SSC). Pat Kuester, currently the Director of Finance and Planning at the KU School of Law, was selected for the position. Pat will transition into her new role on January 6. Nick Stevens and Cindy Nau met with IPSR and reviewed the processes that will occur in the Biobehavioral & Social Research SSC (BSR-SSC). The BSR-SSC posted an accountant position. The position will close Thursday, December 12. Jason Hornberger and Nick Stevens met with leadership from RGS and HBC to discuss the implementation of the Biomedical Research SSC (BR-SSC). The SSC team continues to meet with the Budget Office and Huron Consulting to make refinements to BudCast. Reports that will provide Chairs/Directors with budget status information are complete. LAS-SSC staff will start to meet with Chairs/Directors immediately. The Wave 4 staff met to prepare for their transition to the LAS-SSC on December 16th. Finalist interviews for the Campus Administration & Operations (CAO-SSC) SSC Director were held. On campus interviews were scheduled with the stakeholders of the CAO-SSC. The SSC team met with leadership from LSI and IPSR to plan the implementation of the Biobehavioral & Social Research SSC (BSR-SSC). The SSC leadership team attended a conference to gain an understanding of other shared services in the private sector, public sector, and higher education. The departmental assignments for wave 4 were finalized and communicated to staff and chairs/directors. The implementation date for wave 4 was changed to December 16th. The SSC team met with the area center staff to discuss ways to streamline and better integrate processes. The Communication Ambassadors met. A copy of the presentation can be found here: http://cfe.ku.edu/ssc/documents.php. Cindy Nau, the BSR-SSC Director, started on October 28th. Implementation planning is underway. Several vacancies were filled in LAS: Shirani Gonzales will provide HR support for wave 4; Nanik Rahayu will provide finance support for wave 4; and Brauna Doidge will provide HR support for wave 2. The initial interviews for the CAO-SSC Director were completed. Finalist interviews are being scheduled. The managers of the LAS-SSC and the SSC project team met to brainstorm ways that metrics could be used to ensure SSC success, track staff performance, etc. The LAS-SSC received training from KUCR related to processing grant transactions. Dean Anderson and Karla Williams administered a live poll and a follow-up survey at the CLAS Chair & Director meeting to identify issues faced by units as a result of the SSC transition. The LAS-SSC research staff will be located in 345 Strong. Existing research staff currently located in 50 Strong as well as research staff transitioning with Wave 4 will move to 345 around the December 10th go-live date. Karla Williams, Mark Reynolds, and the LAS-SSC managers completed their initial meetings with the Wave 4 Chairs/Directors. Cindy Nau was selected as the director of the Biobehavioral and Social Research SSC. Cindy currently works at the Department of Commerce as the Executive Director of the Kansas Works Board. She starts on October 28th and implementation planning for the BSR-SSC will begin immediately. Interviews for the director of the Campus Administration and Operations SSC continued. Karla Williams and Mark Reynolds hosted open forums for wave 1 and wave 2 chairs/directors. SSC leadership met with the BudCast team to finalize the financial reports for chairs/directors. These reports will hopefully be available in mid to late October. This team is also working on ways to drive Chartfield1 utilization as well as provide grant reports with forecasted salaries. Karla Williams, Mark Reynolds, and the LAS-SSC managers started meeting with chairs/directors in Natural Sciences and Mathematics to discuss the transition to the SSC and the reconfiguration of responsibilities remaining in the departments. The Design Review Committee met and received updates regarding the status of the SSC initiative. SSC Leadership, IPSR, and LSI met with the two finalists for the Biobehavioral and Social Research SSC. An announcement should be made soon. The Life Span SSC was renamed the Behavioral and Social Research SSC (BSR-SSC) to represent both the Life Span Institute and the Institute for Policy & Social Research as its customers. The search committee for the BSR-SSC director finished the first round of interviews with candidates. The LAS-SSC continued to work through process issues with the Hall Center and the Area Centers. The managers of the LAS-SSC hosted an all staff pizza party. SSC Leadership met with the BudCast team to finalize the reports that will provide fund balances and projections for chairs and directors. These reports should be available within the next few weeks. In addition, several members of the LAS-SSC met to brainstorm ways to utilize chartfield1 in the financial system to eliminate shadow systems and still provide reports to chairs/directors. The search committee for the Campus Administration & Operations SSC (CAO-SSC) director met to select candidates to interview. The staff that transitioned with Wave 3 completed their initial training. The search committee began interviews for the director of the SSC that will support the Life Span Institute and the Institute for Policy & Social Research. The managers in the LAS-SSC attended a performance management training provided by Human Resources. Nick Stevens met with representatives from HR and Huron to discuss opportunities to track metrics for the Personnel Action Form (PAF). SSC Leadership is working with the College Dean’s Office and the Budget Office on modifications required to BudCast to increase adoption within the LAS-SSC and beyond. On August 12th, the LAS-SSC hosted a welcome breakfast for the staff that transitioned to support the International and Interdisciplinary Studies Areas, the Hall Center, the School of Public Affairs and Administration and the College Dean’s Office (Wave 3). The Wave 3 staff started training on all the financial, research, and HR related processes and policies the SSC is responsible for. Karla Williams continued to meet with Chairs/Directors from Wave 3. Karla Williams and the SSC Managers hosted meetings with the staff remaining in the Wave 3 departments to discuss the roles and responsibilities of the SSC and to answer questions regarding process. The LAS-SSC Advisory Board met to discuss and review the status of the SSC implementation, LAS-SSC performance metrics, etc. SSC Leadership continued meeting with the Hall Center to finalize transaction processes. Karla Williams continued to meet with the Chairs/Directors from the International and Interdisciplinary Studies units that will transition to the SSC in mid-August. Karla Williams hosted the second roles and responsibilities meeting with the Chairs/Directors from the International and Interdisciplinary Studies units. SSC Leadership met with representatives from HR to discuss the role of the SSC in keying funding changes into HR/Pay. Representatives from the SSC, HR, and Huron met to discuss metrics related to recruitment, onboarding, and the Personnel Action Form. Nick Stevens met with representatives from Procurement Services and the Comptroller’s Office to discuss proposed changes to the T&E module. Director positions for the Life Span SSC and the Campus Administration & Operations SSC were posted. Both positions close August 23rd and are viewable at http://employment.ku.edu. The research training program was finalized with RGS. Position descriptions, training materials, and all of the initial processes for the SSCs have been created. The project to build the foundation for SSCs was completed this period. Nick Stevens, Karla Williams, and Michelle Ginavan Hayes completed the LAS-SSC process review with the Hall Center. SSC Leadership met with RGS to discuss a process for sharing sponsored project documents between the two entities. Karla Williams hosted the first roles and responsibilities meeting with the Chairs/Directors from the International and Interdisciplinary Studies units. The staff that transitioned as part of Wave 2 continued their initial SSC training. Sonja Stockwell, originally from the School of Business, was hired as the HR Program Assistant to support the units in Wave 3. Jama Lickteig, originally from the Department of Psychology, was hired as the Accounting Specialist that will support the College Dean’s Office from the SSC. Amanda Temple, an external candidate, was hired as the Accounting Specialist to support the School of Public Affairs and Administration. The Design Review Committee met and received status updates on the progress of the overall SSC project. On July 1, Karla Williams hosted a welcome brunch and go-live celebration for the staff transitioning from the Social & Behavioral Sciences (SBS) into the LAS-SSC. Associate Dean Bob Goldstein and several members of the SSC implementation team met with the Chemistry department to discuss interaction of the Chemistry Stockroom with the LAS-SSC. Associate Dean Jim Mielke and Huron Consulting continue to meet with Chairs/Directors in the SBS units to realign activities, rewrite position descriptions, etc. Kristi Thompson and Karla Williams met with the clinics in the SBS division to discuss process flow for departmental deposits. Karla Williams hosted an introductory staff meeting for the individuals transitioning from the International and Interdisciplinary Studies units. Dean Anderson sent a survey to all the Wave 1 Chairs/Directors asking them about the challenges they still face in the department as a result of the SSC staffing shift and any issues they are having with the LAS-SSC. Nick Stevens, Karla Williams, and Michelle Ginavan Hayes met with the Hall Center to review processes and plan for their transition into the SSC in mid-August. The SSC implementation team and leadership from the Life Span Institute met to draft a position description for the Life Span SSC Director and also to review the SSC process flows. The SSC Implementation Team hosted staff from the Medical Center to discuss the KU-L Shared Service Center project. The purpose of the meeting was to share lessons learned, explain the KU-L SSC model, etc. The SSC team met with representatives from Huron to provide feedback on the potential for BudCast to provide financial reports to PIs for sponsored projects. Jason Hornberger and Nick Stevens met with leadership from the Life Span Institute to discuss preliminary plans for the Life Span SSC. The SSC implementation team continued to plan for the wave 2 go-live on July 1st. Karla Williams held the second and final roles and responsibilities meeting with chairs/directors in the Social and Behavioral Sciences. The purpose of this meeting is to communicate the services provided by the SSC, introduce SSC staff to chairs, provide information related to contacting the SSC, etc. On June 25th, Karla Williams and the respective SSC managers held a pre-implementation meeting with the SBS staff. Karla Williams and the managers of the LAS-SSC hosted an end of the fiscal year celebration for the current LAS-SSC staff. The Design Review Committee has approved a change to the campus SSC model. For SSC related services, the Institute for Policy & Social Research (IPSR) will align with the Life Span SSC that is scheduled for a spring 2014 implementation. The results of the Customer Satisfaction Survey have been posted. An executive summary of the research process flows related to SSCs was presented to RGS leadership. A subset of the SSC implementation team met with representatives from Huron and Information Technology to compile requirements for the 3G (GRA, GTA, GA) processes in ImageNow. Several individuals from the SSC team and RGS visited UC-Berkeley to discuss their SSC model. Karla Williams hosted a roles and responsibilities meeting with Wave 2 Chairs/Directors. The purpose of this meeting is to communicate the services provided by the SSC, introduce SSC staff to chairs, provide information related to contacting the SSC, etc. Karla Williams and Kristi Thompson continued meeting individually with Wave 2 chairs/directors to discuss departmental specific needs. The SSC implementation team continues to plan for the Wave 2 go-live on July 1st. Training sessions for the Wave 2 staff were scheduled. Staff training will occur the first 3-4 weeks of July. Associate Dean Bob Goldstein and Mark Reynolds started meeting with the Chairs/Directors from Wave 4 that will shift staff to the SSC. Training feedback from Wave 1 staff was distributed to training facilitators so adjustments can be made in preparation for Wave 2. Nick Stevens met with Patrick Woods in the College Dean's Office to finalize requirements for a Common Scholarship Application Form. Development will begin soon. The implementation team is compiling results from the customer satisfaction survey. The team is hoping to post the results the week of June 10th – 14th on the CFE website. Karla Williams held a staff meeting with Wave 2 staff and communicated departmental assignments. Jim Mielke and Mark Reynolds met with the Wave 2 (Social and Behavioral Sciences) staff to discuss how the departmental roles will change and respond to questions about the transition. The Chairs in the Social and Behavioral Sciences have been focused on redrafting job descriptions to reflect the changes to staff responsibility. Marsha Haufler and Mark Reynolds met with the Wave 3 Chairs/Directors that will shift staff to the SSC. Karla Williams hosted an open house in the SSC on Tuesday, May 28th. Roughly 75 people attended. Kristi Thompson and Joel Hood were hired as the final two Finance Managers for the LAS-SSC. Joel will transition between now and the end of the fiscal year and Kristi will start June 10th. Training sessions for the Wave 2 staff are partially scheduled. Training is provided by a number of departments on campus in the areas of customer service, finance, research, and human resources. A meeting with the leadership team from RGS was held to discuss the integration of designated research centers and SSCs. The research processes that will be utilized in the SSC were reviewed with staff from RGS in preparation for the LAS Wave 2 go-live. Several revisions were identified and the processes will be updated by May 31. The training program for SSC research staff was finalized and presenters from RGS, the SSC, and other units on campus were identified. Based on interviews with chairs, transaction data, and feedback from staff, the LAS SSC Leadership Team met and finalized the staffing for Wave 3. Meetings with chairs/directors and staff shifting to the SSC will occur before May 24. Meetings were held with groups of chairs from Wave 1 to identify issues and create solutions for the departmental gaps. As a lesson learned from Wave 1, meetings were held with chairs from Waves 2, 3, and 4 to try and proactively plan for the departmental gaps created by shifting staff to the SSC. The meetings will continue from now until each respective wave goes live. Transition planning was conducted to outline all tasks necessary for Wave 2 go-live on July 1. Karla Williams, LAS-SSC Director, met with the chairs/directors from Wave 2 to discuss the transition of staff to the SSC; learn more about the inner workings of each department; etc. Jody Milford was hired as the LAS-SSC HR Manager. Jody will transition into her new role over the next several weeks. As a result of Jody's transition, the SSC will immediately post a HR Coordinator position. The Communication Ambassadors met on April 25th for an overall update on the LAS-SSC. In addition, there was a Q&A session with the Wave 1 staff that have already transitioned. The presentation can be found here. The Wave 1 staff completed an evaluation survey for the training they received. The feedback in this survey will be used to make adjustments to the training for future waves/SSCs. The 3G (Graduate Teaching Assistant, Graduate Research Assistant, and Graduate Assistant) appointment and eligibility validation processes were included in the scope of ImageNow Phase III. This project will include a redesign of the current 3G process and workflow automation via ImageNow and is targeted to go-live for the spring 2014 semester. Under Dean Anderson’s leadership, a small team has been formed to focus on solving the departmental gaps in the College created by the SSC transition. The goal is to create an immediate plan to alleviate the gaps in Wave 1 as well as create a proactive plan for Waves 2-4. Michelle Ginavan Hayes was selected as the LAS-SSC Research Manager. Michelle will transition over the next several weeks from her current role at Research and Graduate Studies. Michelle’s initial focus will be to finalize the research processes which were developed last fall, and to establish clear communication and expectations between PIs, departments, the SSC and KUCR staff. The search committees for the LAS-SSC HR and Finance Managers met and selected candidates to interview. Initial interviews for both positions should be complete by May 10th. Meetings were held with the staff and business managers in Wave 4 to gain additional insight into the processes and activities currently happening in these units. The results of these interviews will be shared with the CLAS Leadership Team on May 13th. Mark Reynolds, Director of Finance and Planning, College of Liberal Arts & Sciences. The Design Review Committee met to review the analysis of how research positions are structured and funded across campus. Based on the diverse nature of research centers, the implementation team will continue to evaluate the needs of each research center as they transition to the SSC model. A team lead by Brenda Maigaard, Assistant Vice Provost for Financial Aid and Scholarships, met to review possible software solutions to provide enhanced tracking abilities and projections for scholarships. The goal of this team is to provide enhanced information to the Chairs and Directors to facilitate scholarship decisions. The search committee for the LAS-SSC Research Manager interviewed candidates from the strong pool of internal applicants for this position. The committee is working with the goal of having this individual in place by June 1. Search committees were formed for both the LAS-SSC HR Manager and LAS-SSC Finance Manager positions. These internal searches will close on Friday, April 26. The final LAS-SSC finance manager will be hired this fall. The individuals who will transition from the School of Public Affairs & Administration, the Hall Center for the Humanities and IPSR are yet to be determined. Wave 2 staff will transition to the SSC the first week in July. Over the next few months we will be working with Wave 2 departments to redefine job descriptions of the staff who will remain in the departments to directly serve the academic mission of the department. The Communication Ambassadors met on March 27th for an update on the LAS Wave 1 transition and discussion of progress to date. The presentation can be found here. The Design Review Committee met to discuss the implications of moving staff funded on restricted sources to the SSC. The Committee has asked for detailed analysis of the current state to ensure that the ramifications of the course of action are duly considered. Initial training will be spread over a longer timeframe providing staff with more time to focus on transitioning support for their new departments. Planning for the reorganization of staff within the departments will begin in advance to allow for a successful transition of departmental activities before the SSC goes live. Three manager positions were posted for the LAS-SSC (HR Manager, Research Manager, and Finance Manager). Once these positions are filled, the only remaining LAS-SSC manager position will be a third Finance Manager. All interested staff are encouraged to apply. More information is found here. The LAS-SSC staff continue to settle into their new roles and are embracing the opportunity to deepen their knowledge of the new departments that they are serving. The SSC staff have completed their initial training and are fully shifting their focus to the task of serving their units. Ongoing training and education will continue throughout the year. The amount of time that some SSC staff are spending in their former departments to train the new staff taking over their administrative responsibilities is wrapping up. SSC staff members and the LAS Finance Manager, Ruth Allenbrand, are completing their initial meetings with wave 1 Chairs and Directors to discuss unit needs and set the foundation for collaboration moving forward. At the end of next week, the SSC expects to have the work fully transitioned from all units and will assess the revision of system access for department staff. We will be changing the system access for department staff to reflect their needs in the system based on revised job duties. Associate Dean Jim Mielke met with the Wave 2 Chairs that will contribute staff to the SSC. The College Leadership Team completed individual meetings with Chairs/Directors and met to discuss the staffing for waves 3 and 4. Based on the items that have surfaced, the committee is going to conduct additional meetings with department staff, chairs and directors to ensure all facets of the department are considered for these critical decisions. The Implementation Team has continued work with the central offices to finalize Memorandums of Understanding outlining the role of the SSC versus the central offices. The implementation team has identified the initial Key Performance Indicators for the SSC and will work with central offices to determine the feasibility of extracting the necessary data from systems. The Scholarship Committee met to continue work to develop scholarship tracking and projection tools and a single digital scholarship application. Systems will be evaluated over the coming weeks, including the opportunity to enhance the capabilities of Datamart to meet current needs. On March 18th, the first staff members transitioned to the LAS-SSC! Staff are settling into Strong 50 and embracing their new roles. The first week focused on training of new processes and systems. The SSC web site is now live, offering forms, information and contact email/phone numbers for the SSC. Associate Deans Liz Kowalchuk and Anne Cudd worked with the Wave 1 Chairs and Directors to address the gaps created in the departments by shifting staff to the SSC. Because the snow days delayed these meetings, some staff in the SSC continue to spend significant time in departments to train staff taking over their responsibilities related to the department academic mission. The CLAS Leadership team is meeting with the Chairs and Directors of the Wave 3 and 4 departments (International and Interdisciplinary Programs and Natural Sciences and Mathematics). Jolene Fairchild and Karla Williams led an information session for the staff in the Natural Sciences and Mathematics; this also provided staff in these departments an opportunity to participate in a survey to provide information about future work preferences. The Implementation Team met with Kristi Billinger to discuss the job descriptions and activities for the SSC post-award research administration activities. As the team turns their attention to Wave 2 of the LAS-SSC, continued discussion with KUCR is necessary to finalize the post-award research administration processes and procedures. A team of staff from Central HR and the College Dean's office met with the Implementation Team to review the HR processes to be used in the SSC. Processes were finalized and will be shared with the staff and Chairs of the Wave 1 areas over the next few weeks. A team of staff from Payables Service, Internal Audit and the College Dean's office met with the Implementation Team to review the finance processes to be used in the SSC. Processes were finalized and will be shared with the staff and Chairs of the Wave 1 areas over the next few weeks. Because the proposed revisions to the GRA, GTA and GA process will not be complete prior to the go live of the first two waves of the SSC, a small team met to discuss any modifications to the current process which are required due to the shift in staff. A communication path was established between the SSC and the departments; this will be communicated to the Wave 1 departments over the coming weeks and shared via the SSC web site. Ruth Allenbrand has accepted the position of the first Finance Manager with the Liberal Arts & Sciences Shared Service Center. Ruth's 13 years of experience in the CLAS Budget Office, as well as her knowledge of the needs of the College departments made her stand out as the top candidate among a very strong pool of candidates. In this position she will continue to support and assist the staff serving the College in providing excellent customer service to those departments. The renovation of the LAS-SSC space (Strong 50) is nearing completion, with carpet installation completed on Friday. Computers and desks will be moved in early next week. The Associate Deans in the College continue to work with their departments to prepare staff who will transition into different departmental roles as work migrates to the SSC. This process will be a transition over the next several weeks, and the SSC Director and Implementation Team will work with the departments transitioning to make staff available to provide training and support during the shift. Members of the Implementation Team met with Associate Dean Bob Goldstein to begin to discuss the staffing for Wave 4 (the Natural Sciences and Mathematics) of the LAS-SSC. The CLAS Leadership Team met to review the potential staff for the units of the College included in Wave 2 of the LAS-SSC. Questions were generated which the team is following up on prior to finalizing staff selections. Jolene Fairchild and Karla Williams led an information session for the staff in the International and Interdisciplinary Programs; this also provided staff in these departments an opportunity to participate in a survey to provide information about future work preferences. The Implementation Team continues to review transactional and staffing data to finalize the number of staff to be shifted into the LAS-SSC. The current focus has shifted to wrapping up Wave 2 and beginning the Wave 3 and 4 areas: International and Interdisciplinary Programs and the Natural Sciences and Mathematics. The Research Leadership Team (for SSC staffing decisions related to the research centers) met to begin to review the staffing needs for the Hall Center and IPSR. The LAS-SSC website is complete and is currently being migrated to production by KU IT. We look forward to sharing this once it is live. The team continues to meet with relevant stakeholders to redesign SSC-related processes in the areas of travel, scholarships/fellowships, and graduate appointments. The specific focus over the past two weeks has been an addition to the travel expense process to enable staff to attach receipts to expense records via email, in addition to using the bar code scanning system. The implementation team met to review initial Key Performance Indicators (KPIs) for the financial and human resources functions of the SSC. The next step will be to set a baseline of the current performance to measure changes against. Progress continues on the construction in Strong 50, with expected completion of the space for the March 18th Wave 1 go-live. A search committee from the College and other stakeholder groups completed interviews of the internal candidates for the first LAS-SSC Finance Manager position. The Design Review Committee met to identify the Advisory Board members from the nominations submitted by the leaders of the College, IPSR and the Hall Center. The slate of members and alternates will be finalized in the next two weeks. The CLAS Leadership Team met with each of the Chairs and Directors in the Wave 2 areas to gain insight into the level of SSC support required by each department. Meetings with the clinic directors and clinic staff, coupled with analysis of the transaction data, enabled the implementation team to determine the activities which will remain in the departments and those activities that will shift to the SSC. The implementation team continues to provide data to Dean Anderson to inform staffing support decisions for the academic related activities within the College (i.e. support for those tasks that are not moving to the Shared Service Center). The team met with the CLAS Associate Deans for an information sharing session. Karla Williams is working with the central units to make sure that SSC staff have the necessary system access on March 18th to serve the departments that they support. Karla Williams and members of the Implementation Team are meeting regularly with the Procurement Team to coordinate the KUPPS go-live for the first wave of the LAS-SSC . The training plan that will be used to train staff is complete for the first Wave of the Liberal Arts and Sciences (LAS)-SSC; most individual training owners have finalized dates and are preparing materials. The team continues to meet with relevant stakeholders to redesign SSC-related processes in the areas of travel, scholarships/fellowships, and graduate appointments. A cross-functional group has been assembled to develop scholarship tracking tools and Datamart reports to support the process of awarding scholarships. These tools will be piloted in the LAS-SSC. A subgroup is also working to develop a single, electronic scholarship form for applicants. The SSC Steering committee reviewed the staffing timeline for the LAS-SSC, governance model, organizational structure of the SSC, job descriptions for each functional area of the SSC, customer satisfaction survey, and training plan. Comments from the Steering Committee are being collected and incorporated. Interviews for the first Finance Manager position within the LAS-SSC are underway. The Search Committee had an extremely strong pool of candidates from the University to consider. The Implementation Team continues to review transactional and staffing data to finalize the number of staff to be shifted into the LAS-SSC. The current focus is on the Wave 2 areas: the Hall Center, the Institute for Policy and Social Research (IPSR) and the Social and Behavioral Sciences departments. Jolene Fairchild and Karla Williams led an information session for the staff in the Social and Behavioral Science Departments; this also provided staff in these departments an opportunity to participate in a survey to provide information about future work preferences. The CLAS Leadership Team met to begin to identify staff for the second wave of the SSC. Over the next two weeks, team members will meet with Chairs to gather additional information about each department. The staff selected for the second wave will transition to the SSC in July. The implementation team continues to provide data to Dean Anderson to inform staffing support decisions for the academic related activities within the College (i.e., support for those tasks that are not moving to the Shared Service Center). A research leadership team to make staffing decisions for the Hall Center and IPSR is in the process of being formed. Appointments will be finalized before the next update. Karla Williams and members of the Implementation Team are meeting regularly with the Procurement Team to coordinate the KUPPS go-live for the first wave of the LAS-SSC. The training plan that will be used to train staff as they transition to the SSCs is nearly complete. The plan should be finalized before the next bi-weekly update. The team continues to meet with relevant stakeholders to redesign SSC-related processes in the areas of travel, scholarships/fellowships, and graduate appointments. The team is also working closely with the Procurement Implementation team. Customer satisfaction survey is finalized as a tool to help assess the level of satisfaction with services provided to campus. This will be an annual campus survey, beginning this February. The SSC implementation plans were shared at the quarterly Grant Coordinators' meeting. The search for the first Finance Manager position within the LAS-SSC has closed. The search committee will begin reviewing applicants immediately. The College Leadership Team met to begin planning to identify staff for the second wave of the College (Social and Behavioral Sciences). The wave will not transition to the LAS-SSC until July; however, staff will be identified over the coming week—providing staff who will move to the LAS-SSC the opportunity to apply for the SSC HR, Finance, or Research Manager positions. Karla Williams, LAS-SSC Director, and Dean Anderson met individually with each of the staff that will be moving to the LAS-SSC in Wave 1. Karla Williams, LAS-SSC Director, continues to meet with Chairs and Directors to build relationships with the departments that she and her team will be working for. Questions about the Shared Service Centers may be submitted through the CFE website, or emailed directly to Changing for Excellence. The Design Review Committee met to discuss the final activity list for the Shared Service Center (SSC) and the structure of the Advisory Board for each SSC. The activity list was circulated for final review by the SSC Steering Committee. The College Leadership Team met with each of the Chairs and Directors in the Humanities and Arts Departments as well as the Honors Program. Input was gathered to help make SSC staffing decisions. The Leadership Team met to consider the preferences of staff and the needs of both department and the SSC in making SSC staffing decisions. The P2P Process Owners group met to discuss how changes to the payment process would impact the processing of payments for areas such as fellowships. The SSC Steering Committee subgroup continued work on the SSC job descriptions. Staff from KUEA met with the implementation team to provide input into process changes, training and workflow needs for the SSC. Karla Williams, LAS-SSC Director, began meeting with Chairs and Directors in the College of Liberal Arts & Sciences to start to build relationships with the departments that she and her team will be supporting. Nick Stevens accepted the position of Project Director for KU’s Shared Service Centers. Nick will serve as the Project Director for KU’s SSCs, completing the implementation over the next three years. Nick will work closely with the units to be served by the SSCs to ensure that each SSC meets the needs of the faculty and staff it serves. Nick will transition from his role as the Assistant Vice Chancellor for Research and Graduate Studies during the month of December, assuming his position as Project Director full time on January 7. Nick’s initial role will focus on working with the implementation team to ensure as smooth a transition as possible for the departments and centers of the Liberal Arts and Sciences SSC. Jolene Fairchild and Karla Williams held an information session for the staff in the Wave 1 departments in the College. Staff completed a brief survey on the type of work that they prefer in the future. Karla Williams, LAS-SSC Director, is setting up meetings with Chairs and Directors to start to build relationships with the departments that she and her team will be working for. The SSC Steering Committee met to discuss training for SSC staff, their departmental counterparts and the faculty and staff they work with. The Committee also reviewed the outline of the Service Level Commitment, providing input on the areas to be covered. A sub-group of the Steering Committee has met to refine the activity list for the SSCs. This group is also working on the job descriptions for the SSC staff. The Process Improvement and Training Committees (PITCs) are finalizing process mapping and shifting their focus to training needs and the identification of key performance indicators. The Travel and Expense PITC reviewed the developing SSC website. A subcommittee has developed a web form to facilitate communication with the SSC. The form is being refined to ensure easy options for faculty and staff to communicate travel needs with the SSC. While it is hoped that faculty and staff will find the form an easy method to reach the SSC, they may also communicate their travel needs through a phone call, e-mail or visit to the SSC. The HR in the Departments PITC reviewed the developing SSC website and provided input on the HR content. The committee also provided input on HR training needs of SSC staff. The Tuition and Scholarship PITC met to discuss the fellowship and award processes. The Financial Analytics and Budget PITC met to discuss communication between SSC Accountants and the units that they serve. The committee discussed the need to set up norms for communications, but to expect that SSC Accountants will meet with Chairs, Directors, Deans and Budget Officers on a schedule that works best for the units that they work for. The committee also outlined the training needs for SSC staff, department staff and for the Chairs, Directors, Deans and Budget Officers that the SSC work for. The web site for the LAS SSC is under development. Over the past several weeks, the Communication Leadership Committee and many of the PITCs have provided input on the design and navigation of the site. The Communication Ambassadors met to discuss recent SSC decisions and announcements. The presentation shared can be found here: http://cfe.ku.edu/documents/ssc/Communication_Ambassadors_11-29-12.pdf. The SSC Implementation Team continues to hold open office hours on Tuesday afternoons: please check the CFE SSC calendar for times and locations: http://cfe.ku.edu/documents/ssc/ssc-meeting-calendar.pdf. Questions about the Shared Service Centers may be submitted through the CFE website at http://www.ku.edu/contact/, or emailed directly to Changing for Excellence. Comfortable, welcoming space for staff to work—DCM will be making minor renovations to the space so that it will encourage collaboration and learning, but also give staff the privacy needed to focus on their work. Space where the SSC staff can be located together, providing the opportunity for staff to learn from one another, sharing knowledge and experience and backing each other up. Proximity to the departments, programs and centers that the shared service center staff works for. The Process Improvement and Training Committees (PITCs) are finalizing process mapping, and shifting their focus to training needs and the identification of key performance indicators. SSC staff, with a focus on learning new processes, understanding current policies and knowing where to go for support and information. Departmental staff, with a focus on clear definition of the role of department staff and SSC staff. SSC customers, with a focus on the methods to communicate with the SSC, what the SSC can provide for the departments and what areas the SSC staff can be an informational resource in. The Tuition and Scholarship PITC completed work on the scholarship map, identifying the need for increased Datamart use. Stakeholder discussions recommend that the committee also focus on the development of a common scholarship form (with additional documents to meet unique needs). The Billing and Receivables PITC continues work on a common dataset for invoicing, and has reached agreement on the internal billing process, recommending revisions to the SOV process to eliminate three steps. A pilot departmental deposit process was also finalized for the SSC. The Payroll PITC was able to meet and carefully consider the opportunity to move the time and leave reviewer function to the SSC. The committee decided that this process should be piloted in the first wave of the implementation, giving strong consideration to the opportunity to provide departmental payroll staff with backup so that leave time can be taken. This plan will be reevaluated as we get closer to go-live based on the progress of the PS modifications. Staff with the Institute for Policy and Social Research have completed the first stage of the activity assessment. Next steps on the assessment include a review of the information provided by each staff member (with an opportunity for further comment), followed by input from supervisors. All staff in the three areas making up the first SSC implementation, the LAS-SSC, have now completed the activity assessment. It is currently anticipated that activity assessments for the rest of campus will begin in the first quarter of next year. The Process Improvement and Training Committees (PITCs) continue their careful examination of KU's existing transactional processes, drafting process maps which incorporate the SSC's role in the future design. In addition to the pilot travel and expense process recently defined, the Travel and Expense PITC has identified a candidate honorarium process to pilot in the initial site. Work continues on the web travel and expense form, which will be shared this week with the Communication Ambassadors for input. The Tuition and Scholarship PITC continues to review the scholarship, fellowship and award processes, identifying the role of the SSC staff. The committee identified the need for a technology solution for tracking and maintaining scholarship data. A subcommittee of the Billing and Receivables PITC is considering the potential for a common dataset for invoicing which may offer an opportunity to streamline that process. The Design Review Committee met, finalizing the staff position profile for SSC staff and providing input on the work of the Process Improvement and Training Committees. The staff position attributes for SSC staff can be referenced in the Communications Ambassadors presentation on the CFE SSC website: http://cfe.ku.edu/documents/ssc/Communication_Ambassadors_11-1-12.pdf. The SSC Steering Committee met to discuss the preliminary data gathered in the activity assessments. The search committee has completed the initial interviews for candidates seeking the SSC Project Manager position. Second interviews have been completed for the LAS SSC Manager position. The College of Liberal Arts and Sciences has begun the search for a Director of Finance and Planning. This is a College position reporting to Dean Anderson; the individual hired will also work closely with the SSC staff. More information on the position is here: https://recruiting.ku.edu/. The staff of the College of Liberal Arts and Sciences and the Hall Center for the Humanities have completed the first step of the activity assessment. Staff met in small groups to participate in an online survey to enable the implementation team to gather an understanding of the amount of staff time currently spent on different activities. The results of this assessment will help to determine the amount of SSC staff time dedicated to each respective department. Staff also provided initial preferences for future work. Next steps on the assessment include a review of the information provided by each staff member (with an opportunity for further comment), followed by input from supervisors. Process Improvement and Training Committees (PITCs) have been carefully examining existing processes and are now drafting process maps which incorporate the SSCs in the future design. The Tuition and Scholarship PITC will be pursuing an opportunity identified by one of the HR committees earlier this year to streamline the GRA/GTA/GA form, creating a work flow solution for communications among departments. A subgroup will be assembled to work on this form. While this form is being developed and policy questions are being pursued, the Committee members are beginning to examine the scholarship, award and fellowship processes. The Travel and Expense PITC has identified a travel and expense process to pilot in the initial site. Subcommittees are developing a web form for travel submission as well as travel "quick facts" to make it easier for travelers to find the information they need. In addition to these web tools, the committee identified a clear role for the SSC in providing customer service and information to support travels. The committee has also begun to review the candidate honorarium process. The Billing and Receivables PITC came to agreement around SSCs as processing hubs for AR and invoicing. A subcommittee will be meeting to identify common AR data elements and consider the opportunity for a common invoice. The Financial Analytics and Budget Support PITC previewed the Financial Managers Workbench (FWM) tool which is currently being piloted by the IT Department to help facilitate budgeting and reporting. The committee also discussed the required qualifications for future SSC staff; this information will be used in drafting SSC position descriptions. Post-Award Research Administration PITCs held a full-day meeting to review the re-designed processes. Co-leads reviewed recommendations, and processes to pilot in the initial site are ready for final revisions and discussions. A preview of some of the new research administration processes will be shared at the new Communication Ambassadors meeting on Nov. 1. The SSC Communication Leadership Committee met to discuss the SSC website, which will be a critical component for the SSC communication and training plan (supporting the relationship that SSC staff have with the customers that they serve). The web site will contain contact information, training materials, processes and procedures, and key forms among other information. The Committee agreed to an overall framework for the site; development will begin with input from the PITCs. The search committees has completed the initial interviews for candidates seeking the Liberal Arts and Sciences SSC Manager position. Search committees are interviewing candidates seeking the SSC Project Manager and Liberal Arts and Sciences SSC Manager positions. The committees expect to fill these positions within the next six to eight weeks so that the SSC Project Manager and SSC Manager can take part in the implementation of the first wave of the Liberal Arts and Sciences SSC. The results of the employee satisfaction survey have been compiled and are posted on the SSC website: http://cfe.ku.edu/ssc/employeesatisfaction.php. We wrapped up individual meetings with the Chairs and Directors in the College, IPSR, and the Hall Center. These conversations provided a wealth of input into the plans for the initial SSC. The Tuition and Scholarship Committee has identified several potential policy changes that will eliminate bottlenecks, remove unnecessary work, and improve the student experience. Committee members are connecting with individuals across campus to explore these opportunities. The Travel and Expense PITC is exploring the possibility of creating a web-based form that can be easily completed by travelers and fed directly into the PeopleSoft system. The committee is also considering how the SSC can serve as a knowledge-bank for travelers. The Financial Analytics and Budget Support PITC provided input on the challenges and benefits of providing SSC staff the necessary tools and training required to effectively support their customers in determining and understanding current budget balances. The committee underscored the differing needs of different groups across campus. The Payroll PITC examined processes in the context of newly developed tools. A clear role for the SSC was outlined. The Departmental HR PITC began to discuss the communication tools for the SSC, and considered a list of common HR questions. The committee will review an initial SSC website plan (related to HR) over the next month. Post-Award research Administration PITCs have completed their initial work, and plan to hold a full-day session to review results. The SSC Steering Committee met to discuss the PITC progress, with focus on the work of the Financial Analytics and Budget Support PITC. The Steering Committee agreed with a recommendation that each Designated Research Center be considered on an individual basis to ensure that the needs of the Research Directors are met. As the implementation progresses, the role that each SSC provides will be considered within the total framework of activities required. The Communication Leadership Team met to discuss the best communication methods for reaching staff, faculty, and Chairs serviced by the initial SSC site, especially the Humanities, the Arts, and the Honors Program. For each activity, what is the role of the SSC? What challenges does moving this process to the SSC create? How can this process be standardized? How can we ensure clear communication for customers? How can we better use technology? HR and Finance PITCs plan to complete process maps, standard operating procedures and identify any policy changes needed by October 31. The Research Administration PITCs have completed initial process redesign, with a meeting planned in early October for the individual committees to review all the process, considering how the Academic SSCs will serve all Post-Award needs seamlessly. Staff in the College, IPSR and the Hall Center will participate in an activity assessment in mid-October. Implementation committees, as well as staff around campus, have provided input into the development of this assessment. The assessment will provide a detailed understanding of the diverse work currently performed in the departments, units and centers, and will begin to survey staff for their individual preference for future work. More information on the assessment can be found in the Communication Ambassador presentation http://cfe.ku.edu/documents/ssc/Communication_Ambassador_9-26.pdf. Search Committees have formed to evaluate and interview applicants for the Liberal Arts and Sciences SSC Manager and SSC Project Manager positions. The SSC Manager will lead the Liberal Arts and Sciences SSC and the Project Manager will guide the ongoing implementation of SSCs beyond the initial site. We are continuing meetings with Department Chairs and Directors included in the Liberal Arts and Sciences SSC. Feedback provided by the Chairs has already added great value and will continue to inform and improve the SSC project. Brown Bag lunch sessions have concluded. The sessions in the past two weeks focused on the staffing plans for the Liberal Arts and Sciences Shared Service Center (SSC), an HR workshop on coping with change, and a panel discussion on the Higuchi Biosciences Center SSC model. Twelve (12) sessions were held with a total of 239 attendees. Conducting an activity assessment of current staff to determine what types of work activities individual staff are spending their time on as well the types of activities that individual staff would like to focus on in the future. Forming a leadership team to identify staff to move from current positions into SSC positions: this will involve meetings with individual staff to understand individuals' preferences, as well as input from chairs and directors. More information can be found here: http://cfe.ku.edu/documents/ssc/SSC_Staffing_Group.pdf. The Communication Leadership Committee met to provide input on the plans for the staff activity assessment. The assessment is currently under design, with a goal to conduct the staff surveys in early October. Due to upcoming staffing needs, the Honors College will now be included in the first wave of the Liberal Arts and Sciences SSC implementation. Eleven Process Improvement and Training Committees continue working to develop proposed business processes, identifying the communication and workflow within the SSCs, and identifying any challenges to moving specific activities to the SSCs. The Changing for Excellence Executive Committee met on August 22 and finalized the funding and governance plans for the Shared Service Centers. The key points of the governance, staffing and funding plans were shared in the previous update; more information can be found on the SSC web site at http://cfe.ku.edu/documents/ssc/SSC_Governance_and_Funding.pdf. An activity assessment will be conducted to determine how many staff are currently performing the work moving to the SSC, and to gain an understanding of where each staff member's career interests are. Working closely with the leadership team in the area impacted, the number of staff needed to complete the work of the SSC will be moved, with their associated funding, into the SSC. Staff will be involved in discussions to ensure the leadership committee is aware of staff preferences. School, Center, and Unit leadership will have a key role in identifying staff to move to the SSC and staff who remain to focus on academic and research work. Some positions will be posted competitively, including the HR, Finance, and Research Administration Lead roles as well as the SSC Manager. All positions will be internally recruited. The position of SSC Manager for the Liberal Arts and Sciences SSC is currently posted: https://jobs.ku.edu/applicants/jsp/shared/search/SearchResults_css.jsp. The Payroll PITC will convene in the near future. The Implementation Team continues to hold open office hours on Tuesday afternoons: please check the SSC CFE Calendar for times and locations: http://cfe.ku.edu/documents/ssc/ssc-meeting-calendar.pdf. The SSC Design Review Committee met to consider proposals for funding the shared service centers. The Committee identified a preferred model and is gathering additional input. During the next two weeks, the Implementation Team will continue to vet the proposed model with academic leaders across campus, gathering input to determine the feasibility, sustainability, and other important aspects of funding. The final recommendation will be made to the Changing for Excellence Executive Committee on August 22. The Steering and Design Review Committees have recommended a governance model to ensure accountability for SSC services. Campus leaders in Schools, Research Centers, and Units are reviewing the proposed model which will be presented to the Changing for Excellence Executive Committee on August 22. These lunch sessions will continue over the next few weeks. Date and registration information for future sessions can be found on the SSC website at http://cfe.ku.edu/documents/ssc/brownbagsessions.pdf. Procure to Pay activities in the SSCs will be assessed through the Procure to Pay work stream. The SSC Transition and Space Planning Committee met to begin exploring potential locations for the Arts and Sciences SSC. The Implementation Team continues to hold open office hours on Tuesday afternoons: please check the SSC CFE Calendar for times and locations. The new SSC leadership positions—the KU SSC Project Manager and the Liberal Arts and Sciences SSC Manager—are now posted, with applicant reviews to begin on September 3. View the positions at https://jobs.ku.edu/applicants/jsp/shared/search/SearchResults_css.jsp. Over the next several weeks, we will be offering a series of brown bag lunch sessions related to the SSCs implementation. To keep the sessions informal and allow for questions, we will keep each group size to about 35-40 people, although each session will be offered multiple times. If sessions fill up, we will identify additional times to meet. Sessions, dates and times, and registrations are listed at: http://cfe.ku.edu/documents/ssc/brownbagsessions.pdf. The Transition Planning and Space Committee met to begin identifying space for the Liberal Arts and Sciences SSC. A separate work stream is in place to review the Procure to Pay processes; this team will consider the role of the SSC in the Procure to Pay process redesign. A summary of the focus group input as well as more information about what activities will be considered in these committees is available at: http://cfe.ku.edu/documents/ssc/Finance_HR_Focus_Groups.pdf. The SSC implementation team is continuing to consider how the SSCs will be staffed. A focus group of departmental staff met to provide input. A summary of their discussion is on the CFE SSC website: http://cfe.ku.edu/documents/ssc/SSC_Staffing_Group.pdf. The Design Review Committee and members of the Steering Committee continue to evaluate funding model options for the SSCs. Position descriptions for two new SSC leadership roles—the KU SSC Project Manager and the LAS SSC Manager—are currently in development, with posting anticipated in the coming week. The implementation team is continuing to meet with individuals in the College and its partner research centers to discuss the implementation plan and gather input. Four SSC focus groups met to provide input into which financial processes and activities should be considered to move into the SSC. The input from these groups will be shared with the Steering Committee and the Design Review Committee, which will decide which processes will be considered by the Process Improvement and Training Committees. For each of the activities selected, a Process Improvement and Training Committee will be formed to consider each activity in great detail as a potential fit for the SSC, understand what additional tools and/or technology would be needed if these activities move to a SSC and map current processes (considering each process as it is performed in multiple departments across the University). The Steering Committee and Communication and Change Management Committee provided input into two SSC surveys which are being developed. The first survey is being developed in conjunction with the Technology Support Centers team and will be given to all KU staff and faculty to provide feedback on the current HR, finance, research administration and IT processes. The second survey will be given to all staff and will have two sections; the first section will assess staff satisfaction, the second part will gather input about the SSC design. The Design Review and Steering Committee are continuing to meet to analyze potential funding models and finalize the governance model for SSCs. The implementation team is working with the HR's Learning and Development Manager, Kathleen Ames-Oliver to identify resources to help staff through the change (such as career coaches to help staff think about if they would like to move to a SSC or remain in their department). The Steering Committee held a conference call with the University of Michigan to discuss its experiences implementing Shared Service Centers. The University's Associate Vice President for Finance, who has frequently spoken on the topic of Shared Services at conferences and webinars, answered the Committee's questions and provided his perspective on topics including design, staffing and funding. A brown bag lunch series of workshops is being developed to share background on SSCs, workshops on change and information about KU's plans. Please check the website calendar (http://cfe.ku.edu/documents/ssc/ssc-meeting-calendar.pdf) in the next week or so for dates and times. During the town hall meeting on June 28th, Diane Goddard, Jason Hornberger, and Dean Danny Anderson announced the selection of the Liberal Arts and Sciences Shared Service Center as the initial site. The town hall meeting is located here: http://cfe.ku.edu/ssc/townhall.php. The Liberal Arts and Sciences SSC will be implemented in four waves, beginning with the Humanities and the School of the Arts in February/March of 2013. The Humanities and the Arts will be followed by the Social and Behavioral Sciences in wave two, Global and International Centers, CLAS Administration, and the University Honors Program in wave three, and the Natural Sciences and Mathematics in wave four. The Regional Shared Service Center model was announced at the town hall meeting on June 28th. The model will include three SSCs devoted to serving research units, four SSCs devoted to serving academic units (one of which is the Liberal Arts and Sciences SSC), and two SSCs devoted to administration and operations. After the town hall meeting, several additional volunteers signed up to participate in SSC Focus groups. These groups will meet this week and throughout the summer to provide valuable insight into the work that is currently done in the departments. Their input will inform the selection of processes to be performed by the SSCs. We are seeking additional volunteers: please sign up here: http://cfe.ku.edu/ssc/feedback.php. The Steering Committee and Design Review Committee are continuing to meet to analyze potential funding models and finalize the governance model for SSCs. The communication leadership team continues to develop campus communications. A meeting of the Communication Ambassadors, staff members who will provide two-way communication between staff and leadership, is planned for July 18th. Please use the feedback page on the website if you would like to be considered for the Communication Ambassador team http://cfe.ku.edu/ssc/feedback.php. Also, informal lunch-time discussions will be held throughout the summer. Dates and times will be announced on the SSC calendar after they are scheduled. Surveys are being developed to assess the current customer satisfaction levels, current employee satisfaction, and to solicit input on the SSC design. This is scheduled for release in late July to all staff. After extensive consideration, the Design Review Committee recommended the initial site to the Executive Committee. This recommendation was ratified by the Executive Committee on June 14th. The decision will be announced at a town hall meeting on June 28th. This initial site offers an opportunity to refine the model. While aspects of the initial model are complete, we expect what we learn from early efforts will inform our future work. Members of the Steering Committee and Design Review Committee finalized the KU Shared Service Center model. Discussions with other universities who have implemented shared service models, interviews and meetings with KU stakeholders, and examination of data contributed to the final model for SSC at KU. This model will be released at a town hall meeting on June 28th. As we prepare to enter into the next phase of design, additional committees and focus groups are being convened. The Transition Planning and Space Committee will begin meeting in early July with a focus on identifying space for the initial SSC. This will be a critical first step in moving to an operational center this winter. Work is beginning to identify the tasks that will move into the SSC. A subgroup of the Steering Committee has been meeting to determine the research activities that will be completed in both the research shared service centers and the academic shared service centers. Work groups will be convened in the next few weeks to expand the detail of these tasks. Focus groups are also scheduled to conduct a preliminary review the HR and finance transactions that may move into shared service centers. The communications leadership team has been meeting extensively to develop campus communications around the release of the model on the 28th, and to refine plans for collecting feedback. The initial site will be determined once the campus model is finalized. Members of the Steering Committee and Design Review Committee continue to meet regularly to refine the KU SSC campus model. Discussions with other universities who have implemented shared service models, interviews and meetings with KU stakeholders, and examination of data are providing input into the working model for SSC at KU. Savings were realized as OSU experienced significant growth in enrollment and research expenditures. This growth was supported without an increase in SSC staff. OSU also shared the challenges faced during implementation, providing the Steering Committee with advice on key pitfalls to avoid as KU moves forward with implementation. While the OSU team underscored implementation of shared service centers will take hard work and commitment from staff and leaders throughout the University, seeing shared service centers in action, and meeting the staff who serve in the centers and are served by the centers demonstrated that service centers can make a dramatic improvement in service levels and efficiency in the University’s business processes. A full report is being compiled and will be available on the CFE web site in the next few weeks. As the committees prepare to submit a recommendation to the CFE Executive Committee, we ask that you save the date for a town hall meeting on June 28th from 9:30–11am where we will share the SSC model for the KU campus. Look for location details on the web site soon! You may have noticed a significant change in our news update this week. Based on discussion with staff around campus, we have decided to change the name of our business case from "business centers" to "shared service centers." You may be wondering why we have made this change at this stage of the implementation. 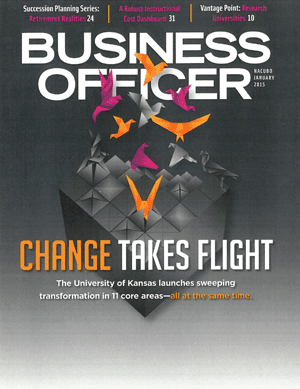 As our committees have met to design "business centers" for KU, there has been universal agreement that, while financial saving are one reason for changing how many of our business processes are done, the end result must focus on providing increased levels of service to faculty, researchers and staff. We have been talking with individuals working in current KU shared services centers, such as the model implemented by Student Services several years ago and the research model, HBC, to understand what works well in these entities as well at as what staff would change going forward. Please visit our web page for information on timeline, committees, other shared services models, and to find out how to participate in the process. Invitations have been extended to the initial implementation teams. Detailed timeline for initial site has been created. Committee charters have been drafted. Working on Big 12 or KU peer site visit. Met with leadership in Information Technology and Research to better understand their activities and potential involvement in Shared Service Centers. Began planning a structure of committees to lead the effort to establish Shared Service Centers. Contacted other universities that have successfully implemented Shared Service Centers to schedule meetings. Continue to refine Shared Service Center transaction data. Continuing to refine Shared Service Center transaction data. Representatives from Human Resources, KU Center for Research, Comptroller's Office, and Huron met to review preliminary Shared Service Center transaction counts and to continue to refine data. Preliminary planning has begun for the Shared Service Center initial site that will eventually lead to the creation of six to nine centers on campus. Identification of key Shared Service Center transactions and associated volume are being identified and collected for all departments on campus.